The CBO just came out with a very interesting study where this singularly interesting nugget of information is embedded in the chart above on page 13 in this report: The Distribution of Household Income and Federal Taxes, 2010. What? How can that possibly be? 106%? That is more than all of it! You need to read the entire report because it is full of fun facts and figures you can use in your daily lives and daily debates about the future course of this great nation. The bottom-line is that the United States is a pretty generous place to live in, regardless of what the Obama Administration and other denigrators of the current American situation want you to believe. 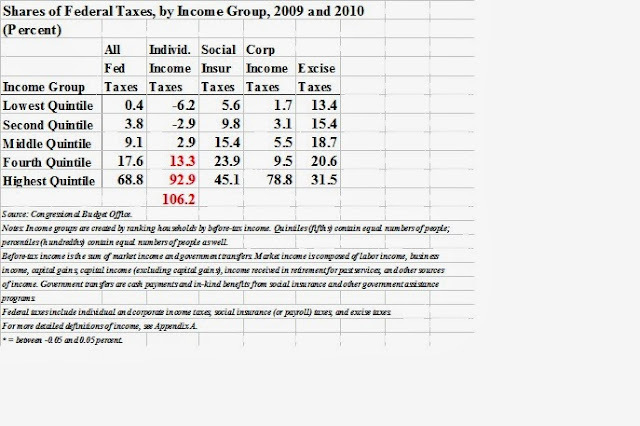 How can certain people pay more than 100% of the total income tax paid each year? It is simple. 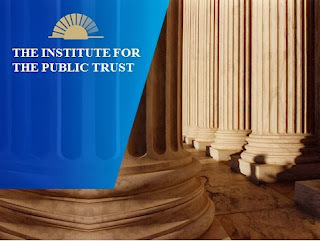 There are things in the current income tax code such as the Earned Income Tax Credit that essentially 'pays' lower income folks a certain amount of money that is 'transferred' to them from higher-income taxpayers in any year they qualify. The lower 40% of income-earners in America receive 9.1% of the income tax paid from the 60% in the higher income categories. That is why they are represented by a negative sign in the chart above. The top 20% of taxpayers pay 93% (92.9) of all income taxes paid. 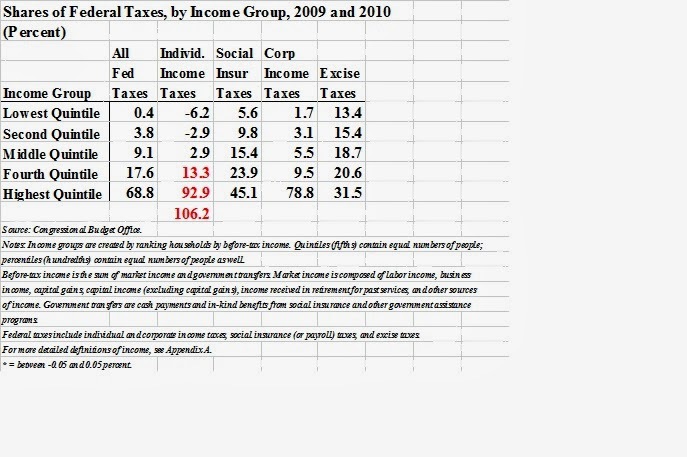 The next 20% pay 13% of all income taxes paid. Add the two together and you get to the magical 106% number you might be seeing on the news lately. Is this 'fair' or is it 'not fair'? Should it be 'more'? Or 'less'? That is why we have politics, don't we? We get to collectively make decisions as to how to build our economy and provide for the basic needs that any great nation would want to provide for its citizens. However, it is important to note the facts when you do engage in the political game. This chart above pretty much proves that the progressive income tax system of America is in fact 'working' in the sense that it is helping lower-income folks by taxing higher-earning income tax payers. 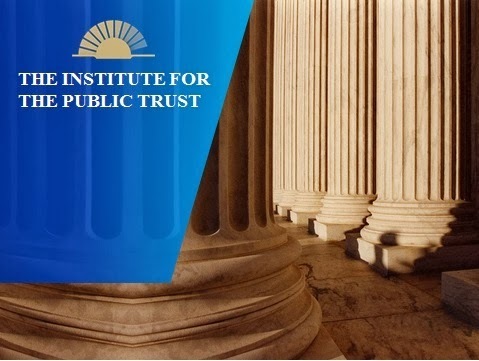 This is over and above ANY welfare, health or social assistance program at the federal, state or local level that provides basic services to anyone at or below the poverty level in America. It is also over and above ANY charitable or religious donation that any lower-income person or family may receive during the year. It is also over and above ANY income that each person may be earning from a job in the private sector, no matter how meager the salary or wages may be. The economic engine of this nation is still the best avenue for anyone making a better life for themselves and their families. We are on the side of unleashing it and letting everyone participate to the fullest extent possible. This is not to insinuate that anyone living at or near the poverty line has it made in the shade and everyone should be trying to trade places with them. We recognize the difficult life circumstances that millions of Americans struggle with every single day. 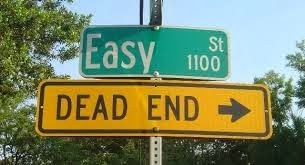 'Easy Street' or 'Dead End'? We are, however, trying to point out the facts of the matter that seem to conveniently elude such people as our sitting President, Barack Obama and many who helped him get elected twice. Apparently, they believe the 106% number should be far higher in order for America to be truly 'fair'.